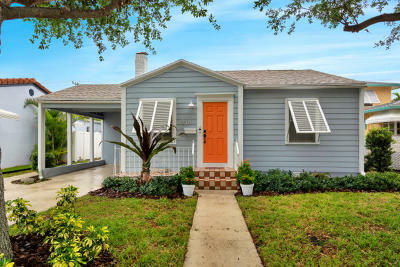 This charming 2 bedroom 1 bath home with a detached bedroom and bath, cabana house in the back. This is ideal for a work at home situation or family needing that extra space. Freshly painted , hardwood floors, French doors, fruit trees & carport with off street parking in front and back.. Florida living the way we like it. The golf course, beach and delightful downtown just blocks away. Centrally located in Lake Worth Beach's Parrot Cove neighborhood. This home is perfect.